Brian K. Vaughan and Fiona Staples’ family space opera Saga is halfway to its end. 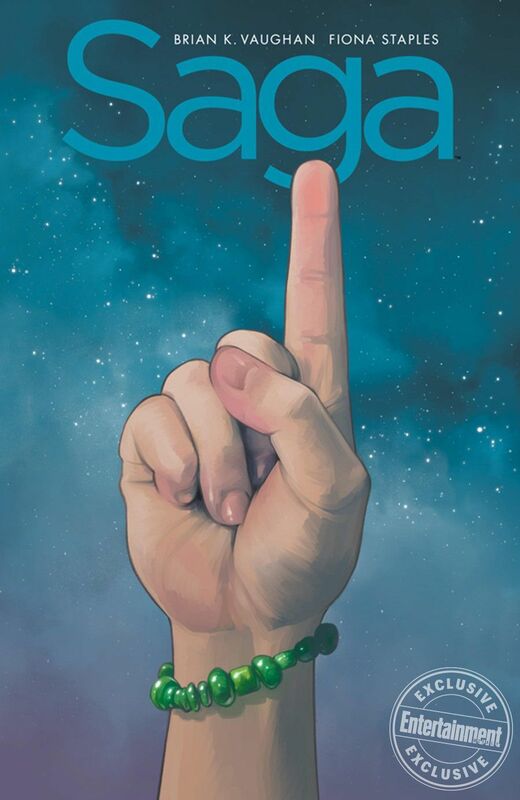 Saga tells the story of Hazel, a child born to parents, Marko and Alana, from opposite sides of a cosmic war. Saga: Compendium One, releasing in October, will collect the first half of the Image Comics series in a single hardcover volume. The series has been on a break since July 2018. Saga: Compendium One will include the 54 issues published before the series went on hiatus. Vaughan tells Entertainment Weekly that a second Saga compendium will follow collecting the second half of the series. The bad news here may be that Saga will be on hiatus longer than some expected. Fans held out hope that the series would be on break for a year at most. Vaughan’s comment about enjoying Saga: Compendium One while the series is still on break suggests Saga's absence will extend beyond October and into 2020. When they announced their Saga break, Vaughan wrote that it is necessary to ensure the quality of the series remains consistent. "After fifty-four issues and over 1,200 consecutive pages of sequential storytelling together, Fiona and I have decided to take an extended break before we eventually reunite with Saga #55,” Vaughan wrote in the letters section of Saga #54. “And unlike our usual three months of 'Vacationanza' between arcs, we plan to pause publication of this series for at least the next year. “This obviously wasn't a decision we took lightly, but Fiona and I feel a responsibility to keep making the very best comic we can, and we both agreed that the only way to eventually finish the epic saga we set out to tell was with this one significant... let's call it... Intermission!" Considering the shocking way that Saga #54 ended, the wait for Saga #55 is a painful one for fans. But on the bright side, Saga: Compendium One makes the publication gap an even better time to catch up with or reread the entire first half of the series. Are you excited about Saga: Compendium One? Let us know in the comments. Saga: Compendium One goes on sale in October.